A stone kitchen hood can take your elegant kitchen to the next level. Nothing makes more of a statement than a custom stone kitchen vent hood. Step away from the typical kitchen vent designs and make a statement with a beautiful stone vent hood. A stone vent hood will become the focal point of your kitchen. Depending on the style you choose, a stone vent hood can add height and scale to your kitchen. Each stone hood is custom-carved and designed to your liking, creating a one-of-a-kind statement piece for your home. We begin with a photo or sketch that you provide (or from our other kitchen hood designs) and use the actual dimensions from your vent appliance manufacturer to build the stone hood around your stainless vent hardware. If you are getting ready to remodel your kitchen or if you are building a new home, consider adding a beautiful custom stone kitchen hood to your design. Below are some beautiful designs to inspire you. Each of these travertine kitchen hoods has a unique style. Stone kitchen hoods can have great intricate details or you can opt for a simpler design. 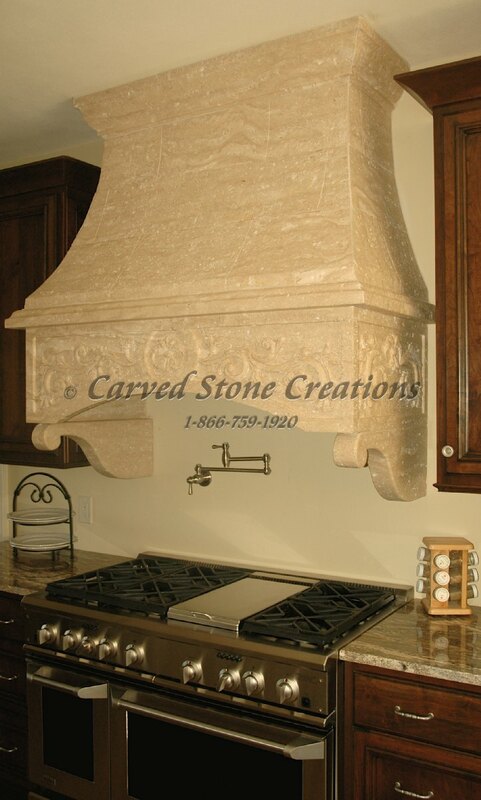 No matter the design you choose, it is certain that your stone vent hood will be the focal point of your kitchen. Limestone is another beautiful material for a stone kitchen hood. The design that is shown below features beautiful carvings that complement the other stone elements in the room and the kitchens style as a whole – like carved limestone corbels supporting the large island countertop.